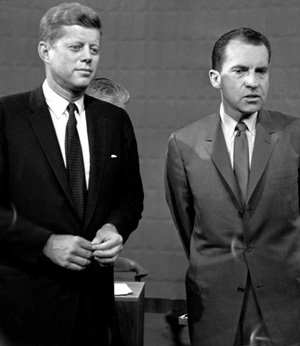 Because he looked poised and confident, it is often said that television viewers felt Senator John F. Kennedy won the first-ever U.S. presidential debate in 1960. Radio listeners, perhaps put off by Kennedy’s New England accent, thought his Republican foe, Vice President Richard M. Nixon, performed better. The notion there was marked disagreement among viewers and listeners is dubious but hardy — and it popped up yesterday in the New York Times, in a review of an art exhibition at Hofstra University Museum. Well, not really: There’s no solid, persuasive evidence to support the notion that radio listeners felt that Nixon had “trumped” Kennedy, or that listeners sharply disagreed with television viewers about who did better in the debate, which took place in Chicago on September 26, 1960. That there must have been such an effect is appealing on many levels, notably because it suggests that appearance can trump substance in politics. But the notion of viewer-listener disagreement in the 1960 debate is a media myth — a media myth that endures despite being thoroughly dismantled nearly 30 years ago in research published by scholars David L. Vancil and Sue D. Pendell. 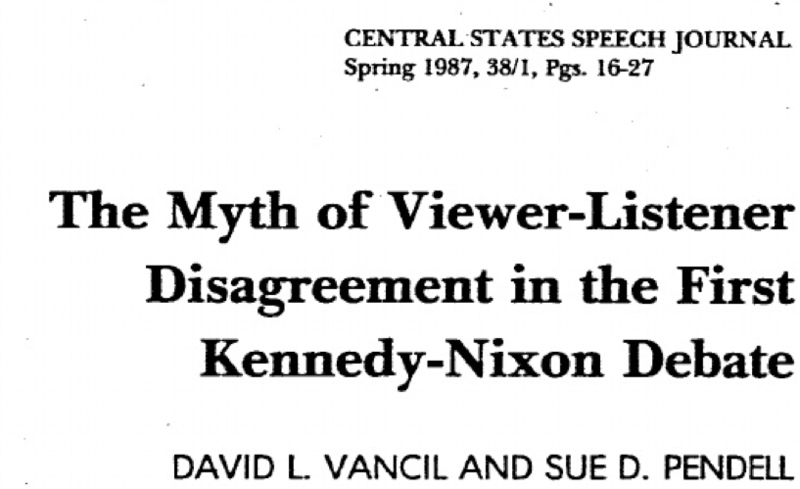 In an article in Central States Speech Journal in 1987, Vancil and Pendell pointed out that accounts of viewer-listener disagreement about the debate typically were anecdotal and hardly representative of the American electorate in 1960. They also called attention to “a false impression” that “major polling organizations, such as Gallup, concentrated part of their attention on the reactions of radio listeners.” That hardly was the case. The one polling organization that did identify radio listeners in a post-debate survey was Sindlinger & Co.
Sindlinger reported that poll respondents who listened to the debate on radio thought Nixon won, by a 2-to-1 margin. But the Sindlinger sub-sample of radio listeners included 282 respondents. Of that number, only 178 offered an opinion about the debate winner, which was far too few to permit meaningful generalizations or conclusions, Vancil and Pendell noted. Those and other defects render the Sindlinger result meaningless. Vancil and Pendell’s article also questioned the notion that Nixon’s haggard and sweaty appearance during the debate was necessarily decisive to views about who won the encounter. It is important to note that a good deal of post-debate commentary declared the Kennedy-Nixon encounter — the first of four debates during the 1960 campaign — to have been a draw, or nearly so. Right after the Kennedy-Nixon encounter, the Associated Press news service conducted an unscientific survey of 100 Americans in 10 major U.S. cities and reported finding that most respondents said they weren’t influenced by the exchanges. A Gallup poll taken in the week after the debate and released October 11, 1960, reported that 43 percent of voters thought Kennedy “did the better job” in the debate; 23 percent thought Nixon was better, and 29 percent said both candidates were about the same. Five percent offered no opinion. The survey, moreover, detected no marked, post-debate shift of support to Kennedy. The survey reported Kennedy to be narrowly ahead, by 49 percent to 46 percent, with 5 percent undecided. Kennedy narrowly won the election, receiving 49.72 percent of the popular vote to Nixon’s 49.55 percent.